The slate blue feathers of the adult fill in gradually on the juvenile little blue heron. Photo by William R. Cox. There are 60 to 65 species of herons recognized worldwide, 20 of which are in North America. They are divided into three groups: bitterns, herons and egrets, and night herons. Florida has two species of bitterns, eight species of herons and egrets, and two species of night herons. The little blue heron (Egretta caerulea) is listed by the Florida Fish and Wildlife Conservation Commission (FWC) as a Species of Special Concern. It is common and widespread throughout most of Florida but is somewhat rare in parts of the panhandle. Its population declined during the 19th and 20th centuries as a result of both human-induced and natural impacts to seasonal water levels at its wetland breeding colonies and foraging sites. It may also be impacted by pollutants as it forages at sites developed by humans such as drainage ditches, canals, fish ponds and impoundments. It can be observed foraging and nesting in both freshwater and saltwater shallow environments, though it prefers freshwater wetlands over saltwater wetlands. 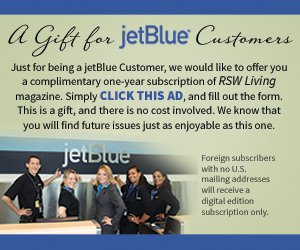 It is common on Sanibel and Captiva Islands, as well as in south Florida. 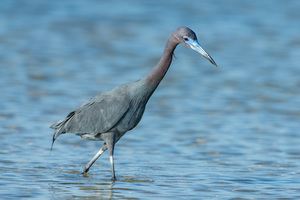 The little blue heron is medium size at 25-29 inches in total length with a wingspread of 40 inches. Breeding adults are slate blue with a shaggy maroon head. The distal third of the bill is black with the rest of the bill and orbital skin cobalt blue (dark gray, in nonbreeding plumage); the iris is grayish-green (pale yellow, nonbreeding); the legs are black (grayish green, nonbreeding). Its long lanceolate plumes are prominent from the head crest to the back during the breeding season. The little blue heron wearing its breeding plumage. Photo by William R. Cox. The little blue heron is unique among North America’s herons and egrets in having a white phase during its immature and juvenile stages. During its molting plumage transition, the slate blue feathers of the adult are filled in gradually, and this stage of development is known as “calico” or “pied.” It acquires its full adult plumage at two years of age. It begins breeding at 11-12 months. The breeding sub-adult obtains the cobalt blue on the bill and orbital skin, but its legs remain yellow-green. When in its white phase, the little blue heron can be confused with four other herons and egrets except for subtle differences. 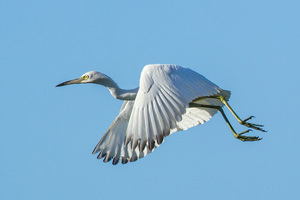 The snowy egret (E. thula) has yellow feet (golden slippers), black legs (black stockings) and yellow lores (the area between the eye and the bill), while the immature little blue heron has greenish feet and legs. It also has dusky tipped primary feathers. The cattle egret (Bubulcus ibis) is shorter and stockier with a yellow-orange bill. It feeds on insects in dry fields where cattle are grazing or large mowers are working. The great egret (Ardea alba) is much larger and has a yellow-orange bill with black legs and feet. During the breeding season it sports green facial skin. The white morph of the reddish egret (E. rufescens) is much larger and has a very long and heavy bill. The tarsal joint, which is informally referred to as the “knee,” is very low on the leg of the reddish egret. The reddish egret is also the most active and entertaining heron or egret as it chases small fish in shallow water. 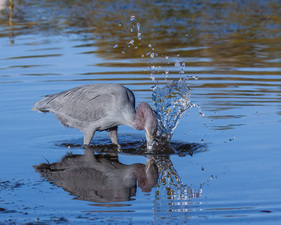 The little blue heron’s diet includes amphibians, fish, reptiles and aquatic invertebrates. It is partial to frogs. The little blue herons that nest in marine-estuarine areas will fly inland to forage in shallow freshwater wetlands because nestlings are intolerant of a high salt content in the prey. This heron is a patient stand-and-wait predator. 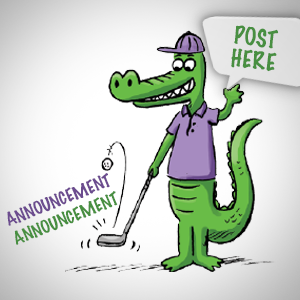 It will also walk slowly through shallow wetlands as it stalks and stabs for prey. The little blue heron in its unique white phase as a juvenile. Photo by William R. Cox. It nests above water in a large variety of trees and shrubs such as southern willow, cypress, red maple, red mangrove and black mangrove. The male may start a nest during courtship but eventually brings sticks to the female as she builds a bulky platform nest. They both incubate three to five pale greenish-blue eggs for 22-24 days. The downy young are semi-altricial at birth. Nestlings can stand and walk out onto branches at 10-12 days. The young are fully feathered and independent, except for feeding, at 21-24 days. They fledge after six to seven weeks and may live to be 12 years old. Setting aside wetland mitigation banks and other preserves for wading-bird foraging and nesting will help the survival of the little blue heron. Enforcing setback distances of 100 meters as recommended by FWC to protect breeding colonies from human disturbance will also help.